Once again a “Dragon Dyansty” DVD has taken me by surprise. The title sounds like a campy exploitation film cashing in on the popularity of kung fu movies. (And it may be the case that the Shaw Brothers had nothing more in mind than just that.) But The One-Armed Swordsman is a surprisingly complete film. Like Spider-Man and other recent comic-book movies, The One-Armed Swordsman takes its time setting up the story. Before we even meet the title character, we discover how his parents die. His father is a servant who loses his life defending his master. In gratitude, the master allows the son Fang Gang (Jimmy Wang Yu) to stay and study, alongside the master’s daughter and his full-tuition pupils. It’s actually fairly close to the setup of Cinderella: an adopted child is mocked and abused by the well-bred, well-to-do children of the same household. Because we know the title, it’s actually a suspenseful introduction. How will Fang Gang lose his arm, and why? The two film critics who provide the audio commentary have something to say about why, dramatically, it happens to our hero. There’s a Freudian interpretation, too, if you like. There are two handy sets of villains. They’re determined to remove Fang Gang’s master from power. Smiling Tiger is the kind of villain who laughs at his own evil. His superior is a man whose face we never get to see — he’s always filmed from the back. After Fang Gang loses his arm, the plot setups keep coming. His father’s sword has been broken in half; it’s still deadly, but what’s the use of half a sword? The villains have developed a sword-grabber that disarms their opponents’ long, bulky swords; how will Fang Gang defeat that? Fang Gang needs to train his left arm, but nobody has written a manual for one-sided fighting. And the woman who rescued him has a book that her father bequeathed. It’s a martial arts manual for two-handed fighting, but the right-handed pages were burned in a fire; only the left-hand pages remain. What ever will she do with such a seemingly useless memento? Like The 36th Chamber of Shaolin, this is one of those films that first-year screenwriting teachers could use as a template. But it’s satisfying nevertheless because the film is so well made. Production values are great. The One-Armed Swordsman was shot on a studio set, and the lighting and color are perfect. The sets are not realistic, but they are elaborate and vivid. On the audio commentary, film critic Andy Klein says they’re like your memory of a place instead of the actual place. The makeup is of a style that matches the sets perfectly — not realistic, but artificial in service of a polished look. The eye shadow and dark brows reminded me quite a bit of Mr. Spock. Somehow, it works. 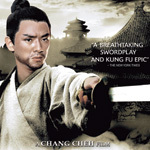 Surprisingly, The One-Armed Swordsman is not a movie you would watch for the fight scenes. They tend to be swordfights, more like a samurai film than a kung fu film. They aren’t bad, but Jimmy Wang Yu is no Gordon Liu. In fact, on the commentary, David Chute seems to keep apologizing to the hard-core kung fu fans that this is more a movie for film buffs than for fight buffs. But for those of us with more of a film background, that’s not really a problem. The One-Armed Swordsman is not as impressive as 36th Chamber (also released on the Dragon Dynasty label), and for the casual movie watcher, it’s probably skippable. Watch 36th Chamber instead. But if you already saw it, liked it, and want to see what else the world of Shaw Brothers movies has to offer, this one is not bad. The two interviews in the gallery (one with the film critics, one with Jimmy Wang Yu) are good. The film critics actually add some important information to the film that’s easy to miss when you see it the first time. They will remind you that this is more than just a dumb action movie. The interview with Jimmy Wang Yu was filmed recently, and it features him reminiscing about his days as an actor. He tells some interesting stories about being paid very little as a studio player and about being dubbed by someone with a better Northern accent. Neither of the interviews are too long, and they are actually informative rather than just marketing feel-good crap. The featurette on Cheh is okay, but it’s not as compelling a story as what’s on the interviews. The audio commentary is very good. Chute and Klein are lively. They have a pretty deep knowledge of the subject. They even know enough Chinese to know the different words for “sword” and how that’s important to the film. They know their Shaw Brothers players, and they like the subject enough that they are always interesting. While watching the movie, I found myself switch between the Chinese audio and the English dub track. The dub track is actually very good. Facial expressions and timing are very well matched, and although the language isn’t a literal translation, the story told in the dub is very close. If anything, the dub track is a little less stilted and formal-sounding than the subtitles. The One-Armed Swordsman is recorded in stereo (ho hum). The picture quality is unbelievably good. I actually noticed a hair on the film in one scene, but it was probably on the original camera negative. That means this video transfer is probably made from a pristine first- or second-generation source (I’m guessing). It’s amazing that such a thing exists after 30 years. I wish the DVD explained how they got such a good transfer. Before you watch the movie, watch the 8-minute “Interview with Film Critic/Scholars David Chute & Andy Klein.” They explain some important stuff that will make the movie more coherent. Skip ahead a few chapters and watch 60 seconds in Chinese. Then watch 60 seconds with the English dubbing. Decide which you like better, and then go back and start the movie.